If you are recently married and feel that you’re never going to be able to own your own home, I’ve got ten absolutely “killer” tips which will help you build wealth, achieve the lifestyle you want and rest easily in the knowledge that your financial future is secure. With all the recent talk of rising house prices and the lack of movement in average income, it’s easy to become disheartened. Feeling that your late start in the investment race is a life sentence to spend the rest of your days paying rent to make somebody else rich, is a very real fear, not only for you, but many other people too. Somewhat counter-intuitively though, these factors are actually reasons “for” getting into the market. The truth is, with house prices in the US well below replacement cost and continuing to rise, consistently, along with floating mortgage rates, getting in now will see you hitching a ride on a skyrocketing investment vehicle. The truth is that one does not have to buy a house to live in. You can in fact buy a property purely as an investment, then use any investment gains from that property to fund future endeavors. The entry point for this is to get into the market with the minimum down payment and repayments, then rent the property out, using the rent to cover the mortgage repayments. This means you will have cash to cover other debts. Also, make sure you don’t rely on just one “GFE (Good faith estimate).” Shop around and get lenders to compete so you get the lowest rate and down payment possible. The simple tips below will explain this in further detail. 1. You have to live somewhere: Look at real estate as a quality of life issue. Would you be buying property with the end goal of having a place to “put down roots?” Or are you the traveling type? If you are, for example, a digital nomad, a traveling salesperson or someone who works abroad a lot, then buying a property needs to be done with this in mind. You would be better off to buy a property which gains value easily, can be rented out without hassle and doesn’t require much maintenance. However, if the long term goal would be to have a permanent abode, you would want to consider purchasing something which you can work on increasing the intrinsic living value of, without necessarily worrying about the market valuation. For example, buying an older three bedroom home with a decent sized property, but which is undervalued due to needing a makeover. Just be sure to determine what you will compromise on. A home like this can rent for a higher amount than mortgage payments would be, allowing you to make headway on paying the mortgage off while living in a cheaper apartment. Then, once your family outgrows the apartment and you have some working capital or equity due to the higher rent payments, you can either leverage the additional equity to purchase another investment, or invest it back into the home, giving it a renovation and boosting the market value while making it comfortable to live in. 2. A home can be an investment: You must be sure to invest your money in assets, not liabilities. Spending “more money” on dining, cars, travel, entertainment and luxuries provides a negative financial return. They do not provide positive cashflow but the increased debt eats away at future earnings, drawing you deeper into debt. A home is different, however. Financing a home using debt can be a good idea. If the home increases in value or you have renters covering the cost of servicing the debt, your net cashflow and asset value increases. This is how you "leverage" borrowed money to earn equity at a very speedy rate. Because of the long term increase in value, known as a “capital gain,” a home can in some cases be an asset due to the net increase to your personal wealth. Other considerations are security of employment. In your twenties, you cannot be one hundred percent certain you will be doing the same job ten years from now. Nor is it certain that your skills will be relevant in future. You may have to take up a new career or become self employed! You cannot predict the future. The luxury of being in one’s forties is the knowledge that you have a stable career, but this is not the case for twenty-somethings. A young married couple needs to be aware of their future within the housing and job markets BEFORE purchasing a new home, as a false move here might provide painful lessons in future. 4. Factor real estate market cycles into your decisions: If you don’t know how long you will be living in one place, be sure to factor this into your buying decision. For example, if you purchase a property as an investment, intending to rent it to somebody in the local community, but you might be moving away within the next two years, you will need to be sure that there is a reliable property manager available who can collect rent, perform maintenance and enforce the rules on tenants in your absence. You need to have a thorough understanding of local supply and demand for property within the local area. 5. Mortgage interest rates make a compelling reason to hurry: In today’s market, where interest rates and property values are low, there are many significant opportunities for a young married couple to buy a home as a long term investment. If you are confident about what the near future has in store for you, and you want to buy a home, it is a good idea to look at the possible gains to be made from investing in the property market. 6. Hire a Home Inspector: Just be sure that the property is fundamentally sound. You don’t want to find out that your property violates a local law or city code, nor do you want to find out it has termites, or won’t hold up in a hurricane in areas of extreme weather. Do your homework and be sure to hire a home inspector. Do your due diligence. 7. A first home can be converted to an investment later: Most newlyweds’ first homes are just an upgrade from a small apartment in which their life together started. Sometimes, the next step is to buy an upgraded townhouse or condominium, or possibly a small single family home. Properties like this are inexpensive at present but provide solid potential for capital gain. As such, they make an ideal investment for young couples who want to mitigate financial risk, have somewhere to live and have mortgage repayments similar to the rent they were paying previously. 8. Buy a home warranty, or get the seller to do it as a sales concession: A home warranty hedges against failure of the building structure or any services running through the house. This provides peace of mind and protects your investment. 9. Use a dedicated buyer’s agent: This will give you access to a wider range of property listings, as well as providing you with some protection from unscrupulous vendors. Most importantly, it removes the inherent conflict of interest that is found everywhere in real estate. The majority of buyers do not work with a dedicated buyer's agent, while the majority of home sellers have a dedicated agent. So think about this ... you ask your agent, which of these two homes should I buy? One offers your agent a $3000 fee, and one offers your agent a $8000 fee. Which one do you think your agent will recommend? The conflict of interest arises out of the fact that different properties offer varying compensation to an agent to sell. But if you first contract a buyer's agent to work for you, you can make it so that regardless of the property selected, your agent will make the same amount of money. With a simple agreement for services, you can remove this conflict of interest that has been causing unknowing buyers trouble for many years. 10. Buy your second home first: If you are part of a young married couple and you feel confident that you will still be living in Tallahassee after five years; buy your second home first, don’t buy a rental. In my experience, newlyweds tend to buy their second homes with family in mind. Don’t compromise on location. Check the following factors to be sure you won’t want to move within a year: School zones - Be sure that the schools your home is within the zone for are appropriate for your children. You don’t want to end up with your kid stuck in a school which is drastically unsuited to their educational or social needs. Moving is an expensive, inconvenient and often financially devastating consequence of poor educational planning. Location of local amenities and childrens’ services - If you both work, chances are the kids will need to go to daycare or school each day. Be sure that getting to these services is easy. Likewise for parks and playgrounds, churches, or whatever other community services you need access to. You don’t want to drive for miles just to go to Sunday School, or to drop the kids at daycare. Other factors to consider are: Number of bedrooms - As mentioned earlier, if you have children, are planning to have children or want the luxury of having guests to stay, be sure to select a house with enough bedrooms. Some children don’t sleep well with a new sibling sharing their room. Other kids sometimes cause trouble or fight when sharing a bedroom, so plan accordingly and avoid stress. Too often, buyers shop for what they need now, but remember, the average home ownership period is 10+ years. What will you need in five years? Number of bathrooms - Nobody likes to queue when nature calls. If you have or intend to have a big family, buy a house with at least two bathrooms. This will cut down on arguments at the start and end of the day, when everyone needs to use the facilities. Ideally, you should choose a home that has a bathroom for guests as well. Condition and style of the home - Don’t buy a house with huge bedrooms and a tiny living room if you like sitting around watching television together. Likewise, if one of you is a budding chef, buy a place with a decent sized kitchen and space for all key appliances. Often times, we see homebuyers fall in love with a feature of a home that blinds them to the pitfalls of the rest of the home. Build you "must have" list and live by it. The Yard - Whether a front or backyard, children need to play and they like to do this outside. One of the benefits of suburban and rural living is the easy access to space. If your family prefers shared recreational areas, then condominiums may be sufficient. Decide your compromise points before you begin your home shopping process. Because of cheap and easy access to debt, young married couples can buy their second home for similar monthly mortgage payments that people paid a few years ago. Appreciation also tends to be higher today than it has been in the past, due to the collapse of the housing market. While it can be difficult to see a home as an investment, the facts speak for themselves. Market values are the lowest they’ve been in years but we are starting to see a slow increase, providing solid returns to real estate investors. So, the question is, do you want to be living in a rented house forever? Can you handle paying money to make someone else rich? Or does the idea of becoming a young property tycoon interest you? Is financial security a dream worth chasing? Or are you content to live day to day, paying out liabilities which never provide any long term financial gain. Remember, property ownership isn't for everybody. As mentioned, there are a number of specific criteria one needs to be aware of. But if you plan on being in the same area for more than a few years, it's hard to argue with the past history of home ownership and appreciation. If you are like many of the "parents" that came before you, the equity in your home 20 years from now is likely to be paying for your children's college. You certainly won't be able to find that money if you are renting. This article provides good tips for newlyweds, and you likely have a better idea of the challenges of property investment. So how do you continue down the path towards homeownership? I have produced an e-series entitled "Home Buying For Smart People," and it’s absolutely FREE!!! 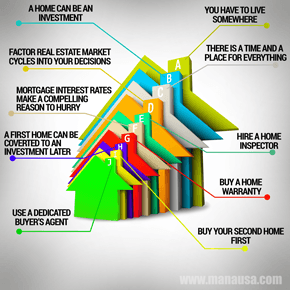 Over the past twenty plus years of helping home buyers, I have developed a better process for buying a home. It saves buyers money in ways they would never have considered if they followed a conventional path to homeownership. All you have to do to enroll in the series is provide your name and email address, and then each day for three weeks you are sent a short email with a link to an article that will "teach" you one critical aspect of a smarter home buying process. This is insider information not available elsewhere and yours for the picking. I hope you are wise enough to take the lessons to heart.